NBC News THINK asked people: Are you looking forward to the midterm elections? Do you plan to vote? Are you excited about the potential change the midterms could initiate? Do you have any clue who the candidates are in your district? 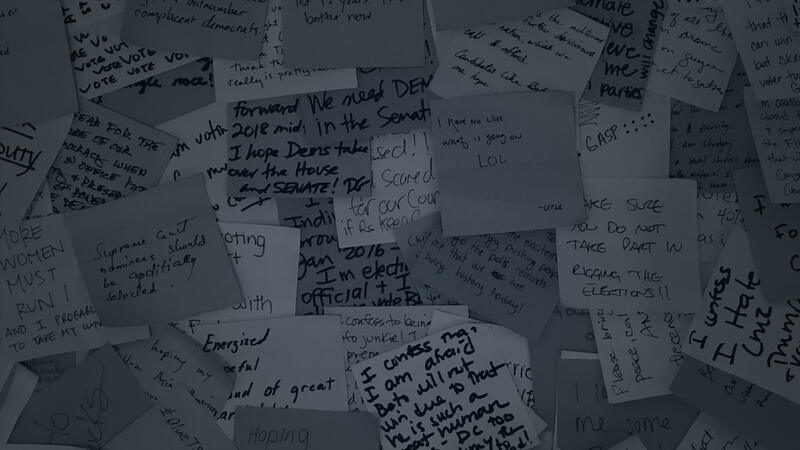 Through an online survey and in-person handwritten messages, we received thousands of stories from around the country from men and women of different ages working in a variety of professions. Here is a sample. For generations now, each side will go for the throat instead of working together. Voting is the least I can do. For the first time since I moved overseas, I’ve requested an absentee ballot. This election is way too important to sit on the sidelines. I’m 58. I first voted in 1980. Was 20 years old. 2nd time I voted was 2016 for Clinton. I went to my first ever political speech 8-26-18 for Beto in Fort Worth. My sister will vote for Cruz. We now don’t talk politics. I have convinced my husband and family they must vote. First time my family will all vote in midterms. This is my first midterm to vote. I am 56. I also registered my 18-year-old daughter. My wife. My mother. And my stepfather. We are all voting Democrat. That’s five extra votes Dems didn’t have last midterm. I can’t wait to get rid of our Republican congressmen! Literally the only reason I’m voting is because of Kavanaugh. I was horrified that they ran his name through the mud with no evidence, and I’m afraid that in the era of #metoo anyone can come against me and ruin my life publicly with no evidence. This is my first time voting, and I am voting pretty much across the board Republican and I hope that Washington gets the message. As someone who did not spend the time to really defend my thinking, I have spent the past two years really paying attention. I watch the news. I read the articles. I do my homework. I tell others to educate themselves before making decisions, and have made sure to practice what I preach. I try to listen. I try to hear all perspectives. That said, I find myself more angry than I’m proud of much of the time. Daily, I am disgusted by people picking politics over humanity. I am disgusted by the promotion of fear rather than love. And just when I think I cannot be shocked any more, a new report comes out. Yes, I’m ready to cast my vote in the midterms, and if you are not then you have not been paying attention. Living in super red TN. Most of life voted Republican. The GOP is no longer for me. They have moved way too far to the right, allowing evangelicals call the shots. Looking forward to midterms to vote all Dem votes for the first time ever. To make a statement that something needs to change. Being in this state one feels that their vote for any other than a Republican candidate is useless. TN will probably still go all red, but I will feel better for letting my opposition to this administration and all associated with it be heard. I think the midterms are not going to go well for Democrats. I am a Democrat who is very frustrated with the arrogance of the party and their refusal to deal with voter turnout problems. There is too much reliance on social media. The Democrats have to mount an organized and determined voter turnout effort or they are going to lose and keep losing. I look to every election in which I’m eligible to vote with great enthusiasm. As a woman and the descendant of slaves I don’t take my right to vote lightly. I’m very aware of voter suppression efforts designed to silence people like me, but I will be counted. I have nothing to dread. A lifelong Republican, I’m going to march into my voting booth and vote straight ticket Democrat. My party has taken such a strange and radical twist that I no longer recognize it much less support it. Can’t wait to vote! I’ve never voted for a major party candidate before in my life but may vote Republican for the first time ever based on how Democrats have been acting. I think a lot of commentators underestimate how angry women are. I believe, and hope, they vote in droves. Been a Democrat all my life and will be voting red across the board this November. If you vote Democrat this year after all the BS that has been pulled and the far-left views that are spouted, then you have a serious character problem. Maybe the Dems can find themselves again after they lose. My husband and I have been fighting nonstop since the 2016 election for the country we believe we can and should be. Our physical and emotional health have suffered. I have been inspired so deeply for change, I am running for a county supervisor seat as an Independent. A platform based on community rights and no major party affiliation has been cheered by most everyone I speak with. I am from North Dakota and I feel like my voice, my opinion and my vote doesn’t matter. My elected officials do what they want despite all of my letters, emails and phone calls. I wish all of the elected officials in my state could be dumped so we can start over. I fear more division and hatred is coming our way from both sides. I’m tired of the us vs. them mentality. I have become a horrible person in the last two years. I used to donate to any hurricane relief effort, but since [the White House] has given FEMA $$ to ICE, I continue to contribute to Puerto Rican relief instead of Hurricane Michael relief. Knowing what we know now about meddling and interference on ballots, how can we ever have faith votes aren’t tampered with? I was a lifelong Republican voter, since my first vote in 1972. I will never vote for a Republican for any office after the way the GOP has enabled Trump. Ever. I am a registered Republican who did not vote for Trump and will not be voting for Republicans running for office. I do think it’s comical that people act shocked and outraged at all of the sexual assault allegations (which we should be outraged) but yet elected a president who is clearly misogynistic and has allegations of sexual misconduct himself. Have you confessed? Tell us your #ElectionConfessions2018 here.